For moderate-volume SureBind® jobs, this electric punch and bind system combines power with space efficiency. The GBC SureBind System-Two is the ultimate desktop strip binding system for moderate volume users, combining power with space efficiency. 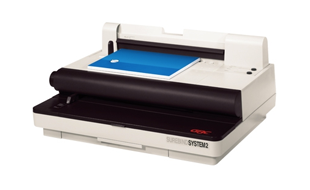 This fully electric punch and bind system saves time, perfect for the busy office. Pressure bar and adjustable paper alignment guide secures sheets in place, to bind documents up to 50mm or 500 sheets. Interested in the GBC SureBind System Two?